The first weekend of spring is here. After a long wet winter, the flowers are blooming all around town, including the cherry blossoms. Here’s your guide. Participate in the Japanese custom of “hanami” by going to the Cherry Blossom Festival this weekend. The 14th annual event will feature cherry trees, Japanese street food, beer and tea tastings, a children’s corner, cultural performances and vendors. More than 12,000 people attended the festival last year and organizers expect the number to be even higher this year. 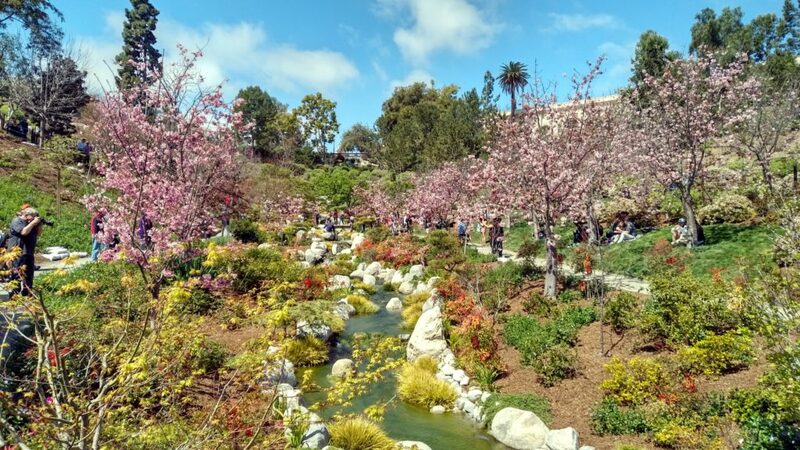 The festival runs from 10 a.m. to 6 p.m. Friday, Saturday and Sunday at the Japanese Friendship Garden in Balboa Park. Tickets are $12 for adults, $10 for seniors and free for kids under 6. The Bankers Hill Art & Craft Beer Festival returns for its seventh year this Saturday at historic The Abbey on Fifth Avenue. The two-story venue will be the showcase for a range of San Diego craft breweries and Bankers Hill restaurants alongside pop-up galleries of local artists’ works and is expected to draw more than 500 attendees. Guests will have unlimited access to complimentary 2-ounce pours from 15 well-known San Diego breweries. The festival goes from 6 p.m. to 9.m. Friday. Tickets are $30 per person presale and $35 the day of. The 1,000 Lights Water Lantern Festival — a well-known festival that travels from city to city — comes to San Diego this weekend. The event, held at Santee Lakes, features, food trucks, live music, interactive games and, of course, lit up water lanterns floating across the lake at sunset. The festival is based on Eastern water lantern festivals, which organizers hope to help people to connect with their hopes, dreams, and loved ones, past and present. The 1,000 Lights Water Lantern Festival goes from 4 p.m. t0 8 p.m. Saturday. Tickets are $29 for adults, $13 for children ages 10 t0 13 and free for children ages 9 and under. Admission includes a lantern and decorating kit. The Living Coast Discovery Center is opening a new seasonal exhibit, SEA the Change, this weekend. The special exhibit features a number of new animal ambassadors, including an opossum, green tree boa, dart frogs, panther chameleon, legless lizard and western pond turtle as well as interactive displays and nature-influenced art. The exhibit shines a light on critical environmental issues such as habitat destruction, ocean pollution, coral bleaching, climate change and more. SEA the Change‘s grand opening party goes from 10 a.m. to 2 p.m. Saturday and Sunday at the Living Coast Discovery Center. The event is included in the admission to the Living Coast Discovery Center, which ranges from $11 for children to $16 for adults. Thousands of glimmering butterflies fly free among colorful plants of succulent nectar at the Butterfly Jungle at the San Diego Zoo Safari Park, which is opening this Saturday. Visit the North County park to witness thousands of beautiful butterflies surround you. The event helps support the conservation of sustainable habitats for butterflies, as farmers contribute to the butterfly population by raising pupae for zoological exhibits worldwide. Visitors are encouraged to wear bright colors so the butterfly will be attracted to you. Butterfly Jungle is opened daily from 9 a.m. to 5:45 p.m. through May 12. Admission is included with the admission to the park. Ladies Rock San Diego, a rock empowerment camp for women returns to San Diego this weekend. At the three-day intensive program, participants form a band, learn an instrument, write an original song which culminates in a public performance at the House of Blues. The camp takes place from 2 p.m. to 9 p.m. Friday, 8:30 a.m. to 7:30 p.m. Saturday and 8:30 a.m. to 3 p.m. Sunday at A.R.T.S. Tuition is $275. Those interested in participating are encouraged to register as soon as possible as spots fill up fast. Ladies Rock San Diego showcase goes from 4 p.m. to 6 p.m. Sunday at the Voodoo Room at House of Blues. General admission tickets are $10.